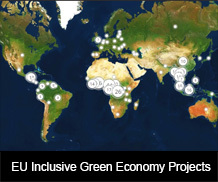 EU Delegations, identifying and formulating actions relevant to inclusive green economy. EU actors play a major role in improving coordination among green economy related initiatives and ensuring lessons sharing, towards promoting the implementation of the Flagship. Through its facility the Flagship targets DEVCO, other DG and EUD staff by providing Technical Assistance aiming at improving coordination as well as building awareness and capacities on inclusive green economy. For example, the Facility coordinates with DG ENV, building on the latter’s knowledge of green economy related policies in the European context, with a view to identifying European good practices, streamlining relevant terminology and preparing publications on relevant EU domestic experience.